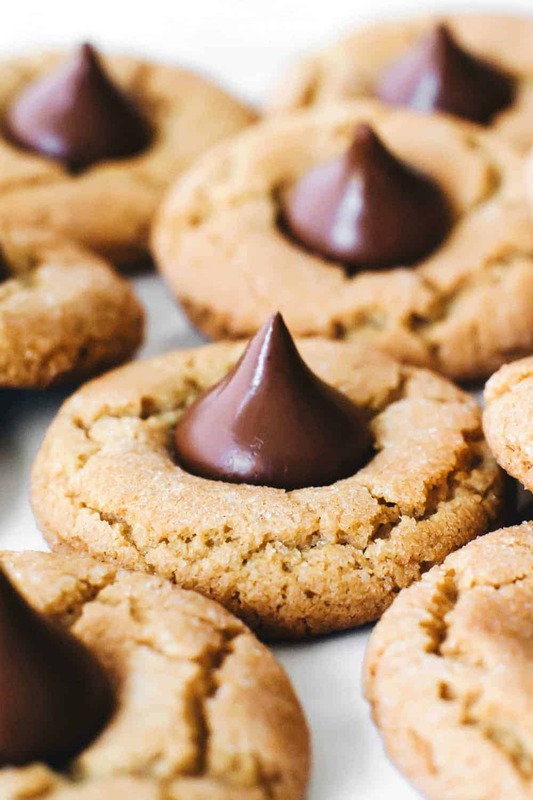 Peanut Butter Blossoms – sometimes known as Hershey Kiss Cookies or Peanut Butter Kiss Cookies – are the perfect classic holiday cookie to make with kids or bring to a cookie exchange. Many of you know that I used to teach school full time – more specifically junior high. I taught in a separate facility that worked with students that require a pretty structured environment due to behavior issues. I found myself with an extra period each Friday and had to figure out something to do with the 50 minutes that would both keep the kids busy and force them to interact with each other in a positive manner. I remember sitting at the computer when it hit me – I could have them cook and bake together. Within this flash of brilliance, there was one problem. Our school kitchen lacked pretty much every single piece of baking/cooking equipment aside from an oven, refrigerator and freezer. Our school breakfasts and lunches got delivered from an off-site company, so the drawers revealed a sorry assortment of slotted spoons and a search of the cupboards only turned up some sheet pans. Refusing to let this minor detail defeat me, I decided to send a few emails to some incredibly generous companies. Within days, some amazing companies were arranging to outfit my little makeshift home-ec kitchen with the tools necessary to bake and cook with my students. I quickly pretty much relinquished all control over what we cooked and baked to my students. I allowed them to choose the recipes, create the shopping lists and make the dish from start to finish (minus any knife work). Although I was a little bit nervous with the whole process, the students displayed an amazing amount of teamwork and enthusiasm – honestly, I couldn’t have been more proud of them. During the holidays, we decided to make Peanut Butter Blossom Cookies. 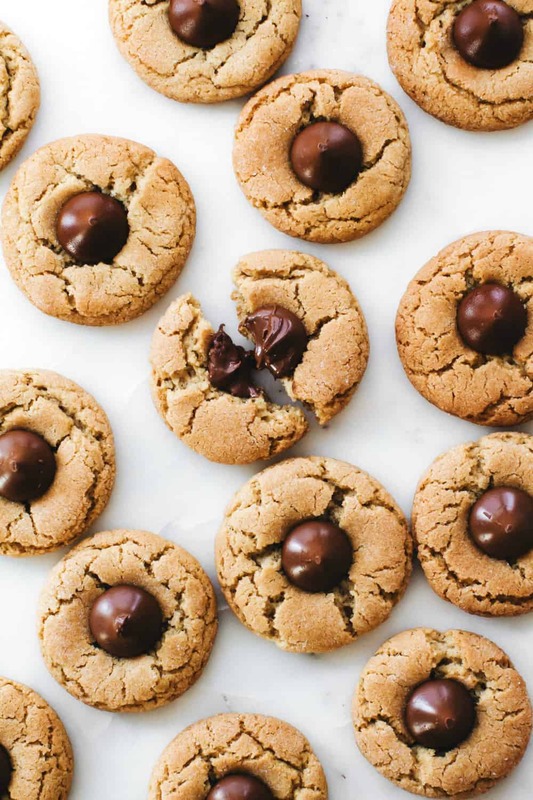 I thought there was no more perfect time of year to introduce them to this classic chocolate-peanut butter cookie. After all, no holiday season is complete without these or Easy Snickerdoodle Cookies! The kids were all about the “mini ice cream scoop” (cookie scoop) and were pretty amazed that the Hershey Kisses didn’t completely melt into a puddle. Even though I haven’t taught full-time in years, I’m still grateful for the opportunity to allow my students to channel their creativity and curiosity in a positive way. I hope they still remember making Peanut Butter Blossoms together and taking them home to share with their families. 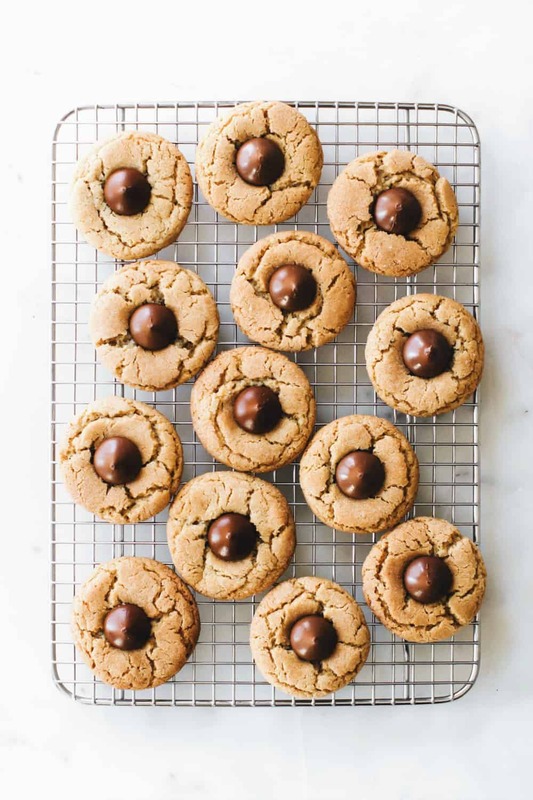 I think that just about anyone who has ever been to a holiday cookie exchange has at least seen, if not eaten, Peanut Butter Blossom Cookies. They’re a holiday staple! 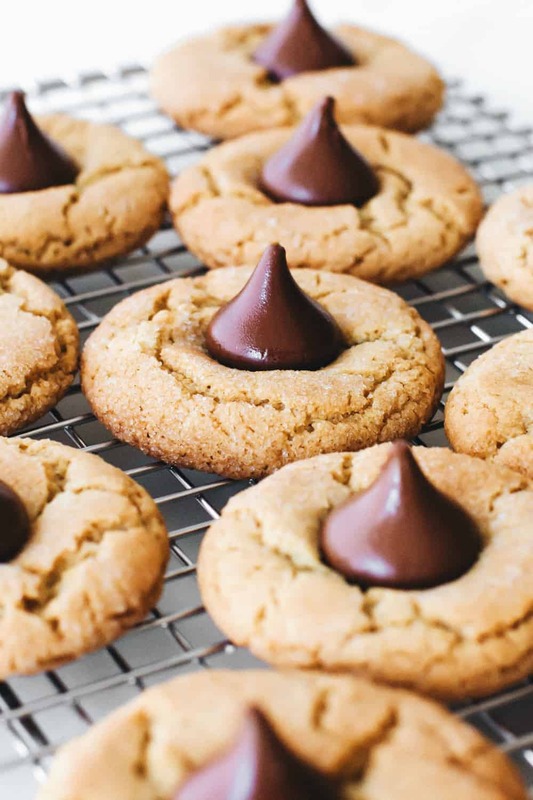 The name might change – I have heard them called Hershey Kiss Cookies, Peanut Butter Kiss Cookies, and even Chocolate Kiss Thumbprint Cookies – but the peanut butter sugar cookie with a chocolate kiss pressed into the middle stays the same. 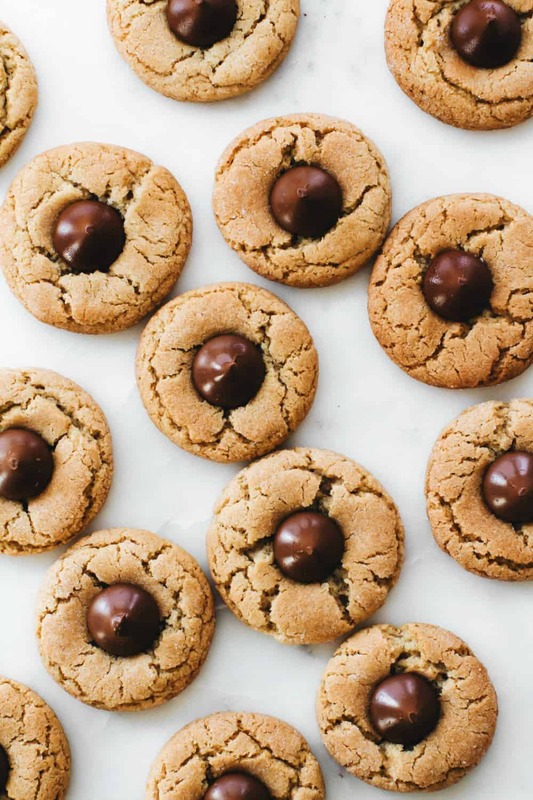 Peanut butter blossoms are easy and fun to make. The dough is a simple sugar cookie dough with peanut butter added to it. 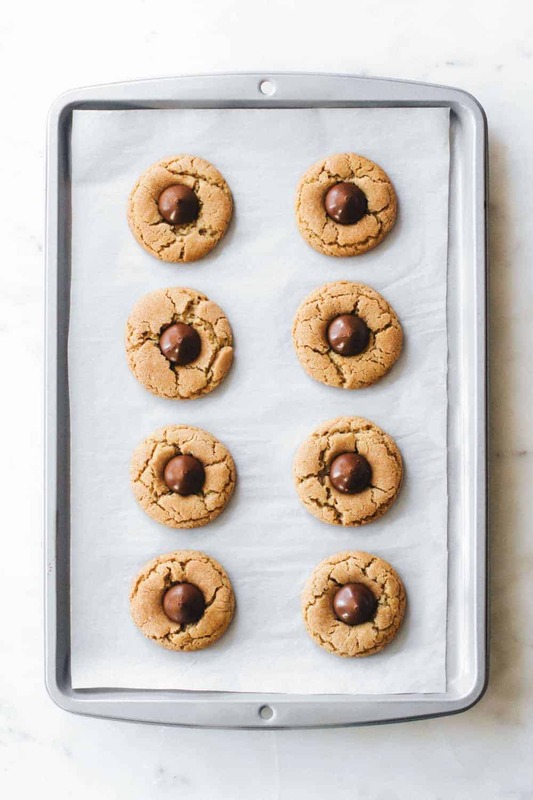 One thing that makes this easy peanut butter blossoms recipe great to make with kids is that the dough doesn’t need to chill. That’s right, no waiting! There are also lots of steps kids can help with. 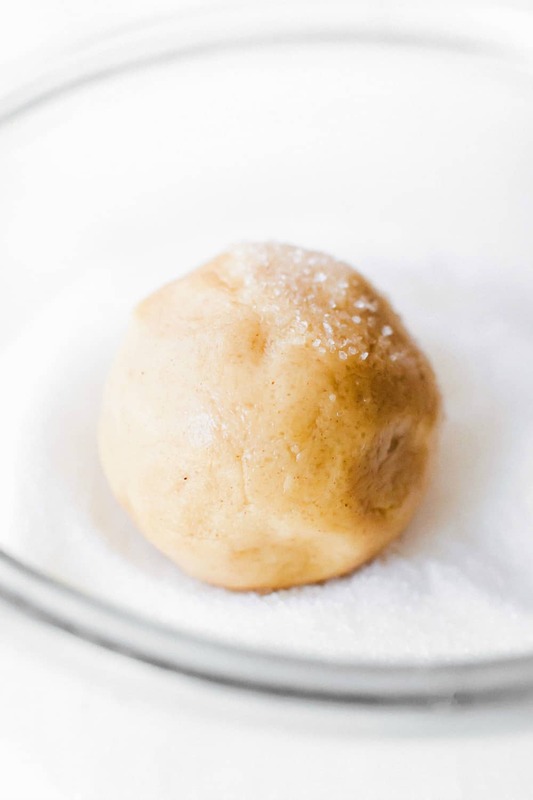 Older kids can help make the dough, and kids of all ages can roll the dough into balls and roll them into granulated sugar before baking. 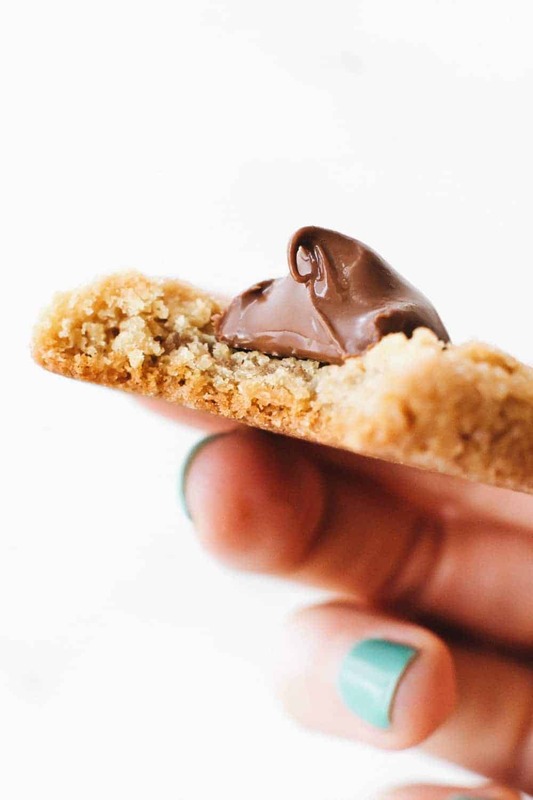 They can even help press the chocolate kisses into the tops of the freshly-baked cookies. Just make sure an adult is around to help as the cookies will still be hot. 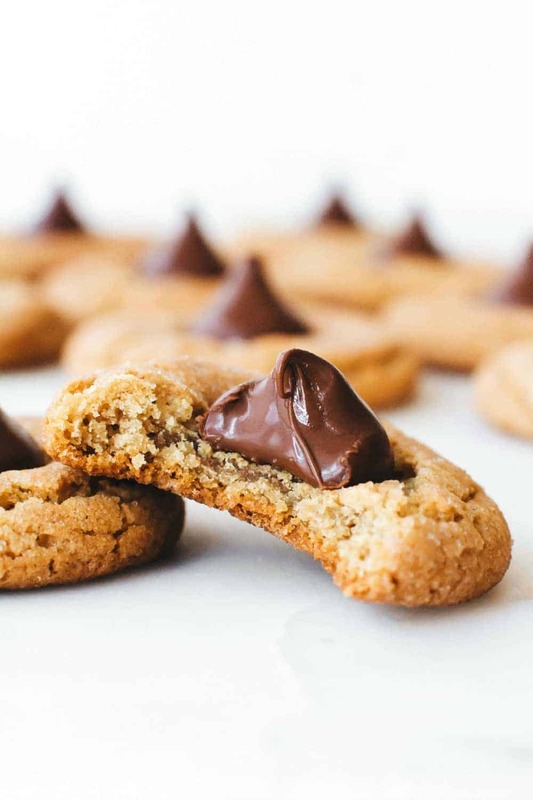 Store Peanut Butter Blossoms in an airtight container at room temperature for up to 3 days. Because they don’t need to be refrigerated and will stay good for a few days, they are perfect for taking to a cookie exchange or even overnighting to friends and family. 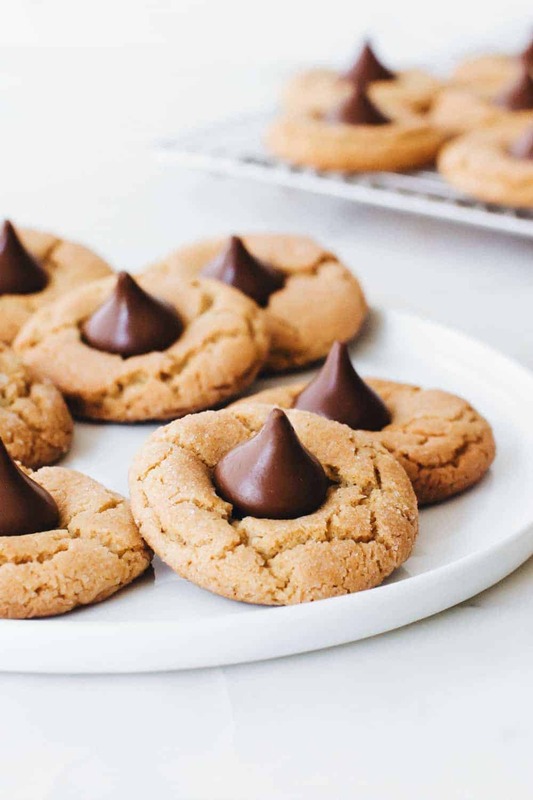 If you or someone you know has a peanut allergy, you might be wondering how you can make these Hershey Kiss Cookies without peanut butter. SunButter, or sunflower seed butter, is a great substitute for peanut butter in recipes. It has a similar texture and flavor to peanut butter but without the nuts and should work just fine in this recipe. 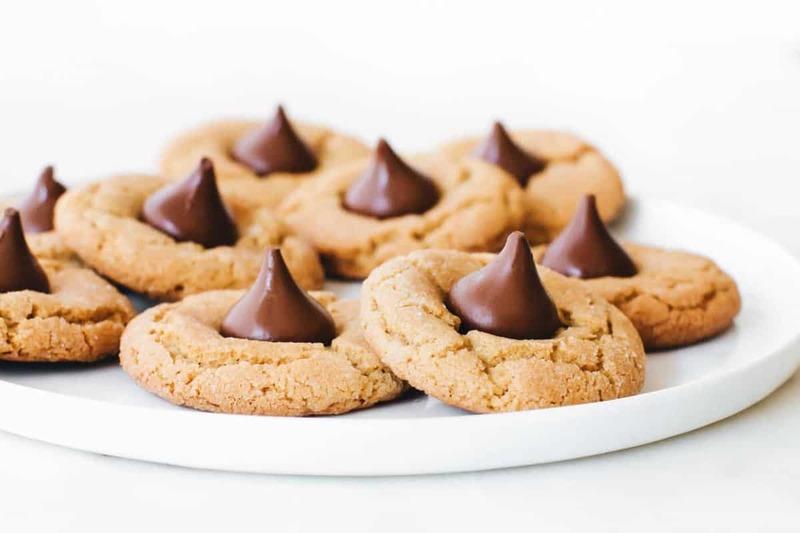 Looking for some variations on these classic Hershey Kiss cookies? Check out Chocolate Almond Kiss Cookies, Chocolate Mint Kiss Cookies, Candy Cane Kiss Cookies or Biscoff Blossoms! 2. In a large bowl, cream together shortening, peanut butter, brown sugar, and 1 cup white sugar until smooth. Add in the eggs one at a time, beating until fully incorporated. Mix in milk and vanilla. 5. Bake in preheated oven for 10 to12 minutes. 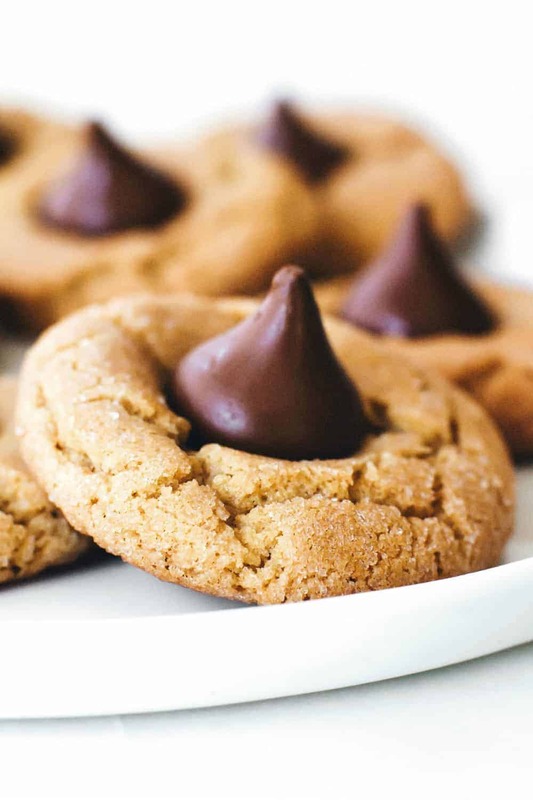 Remove from oven, and immediately press a chocolate kiss into each cookie. Allow to cool completely; the kiss will harden as it cools. This makes a lot of cookies, but it’s perfect for cookie exchange prep or holiday parties. I have not attempted this recipe using butter instead of shortening.